Playhouse, Sydney Opera House, August 21. THE Tempest starts in tumult and ends in calm. Prospero, ejected from his dukedom of Milan 12 years before, is going home. His daughter, Miranda, is to marry the heir to the throne of Naples, ending the enmity between two great houses. Ariel and Caliban, the light and dark creatures enslaved by Prospero on his strange island of exile are set free. Virtue has won over vengeance. John Bell’s reading of Shakespeare’s late romance shimmers with light, fills the air with music and reaches into the heart with the most wonderful simplicity. Unburdened by contemporary social and political theory, it is concerned with self-discovery. Prospero has paid the price for putting his head in his books and letting his ambitious brother, Antonio, do all the heavy lifting in Milan. In the course of one afternoon – the timeframe is highly explicit – the key players in the story come together and harmony is restored. “My charms I’ll break, their senses I’ll restore and they shall be themselves,” says Prospero near the end. They shall be themselves: it is the most profound of all outcomes. The Tempest opens with a cracking storm and shipwreck as Prospero’s enemies, handily passing by, are tossed on to the island. Alan Johns’s operatic score, designer Julie Lynch’s wildly billowing curtains and Damien Cooper’s expressive lighting immediately conjure a world of theatrical magic in which anything might happen. We see two young people fall in love at first sight, regicide attempted, buffoons ape their betters and insanely plot a coup, sorrows endured and wonders beheld. Lipson’s Prospero, orchestrating these events, is less a tyrant than mercurial, slightly distracted professor. For all his powers he is intensely human, admitting “some vanity of my art”, hugging Miranda (Eloise Winestock) fiercely and keeping Ariel (Matthew Backer) captive with something that feels very like an ageing man’s neediness. When Backer stands beside Lipson, looking very much a younger version of him, there is a sense of what Prospero wanted to be – a free spirit unburdened by the cares of office. But that is not possible in the real world. Ariel is very much at the centre of things, watching gravely and intently as the tasks he has been assigned bring the pieces of the story together. Backer is transcendent, a seamless amalgam of intelligence, other-worldliness, understanding and yearning. And he is given some delicious pieces of business too, making spirit-world light of lifting a log the young Ferdinand finds so heavy and clutching his ears in pain as a badly sung song assaults his senses. There’s much joy and laughter too in the Stephano-Trinculo subplot, in which Hazem Shammas and Arky Michael come up a treat in commedia dell’arte antics and fantastical clothing and are howlingly funny. In this fine cast Winestock is at present too skittish but has one of the evening’s most delicious moments, Felix Gentle is a sweet-mannered Ferdinand, Damien Strouthos powerfully conveys Caliban’s hurt and Robert Alexander has effortless nobility as Prospero’s old friend Gonzalo. Maeliosa Stafford’s bluff King Alonso and Shammas and Michael doubling as Antonio and Sebastian complete the company. This Tempest would delight on any occasion but has particular poignancy as Bell farewells the company he founded 25 years ago. In the epilogue Prospero speaks directly to the audience and asks for its good will. He has wanted only to please and needs the audience’s approbation before he can leave his enchanted island. “Let your indulgence set me free,” he says as the lights go out. On opening night the audience rightly stood as one and turned to Bell, giving him a sustained ovation. It should be noted, however, that next year he directs for Opera Australia and next month appears in Belvoir’s Ivanov. Bell’s revels are not ended, not by a long shot. 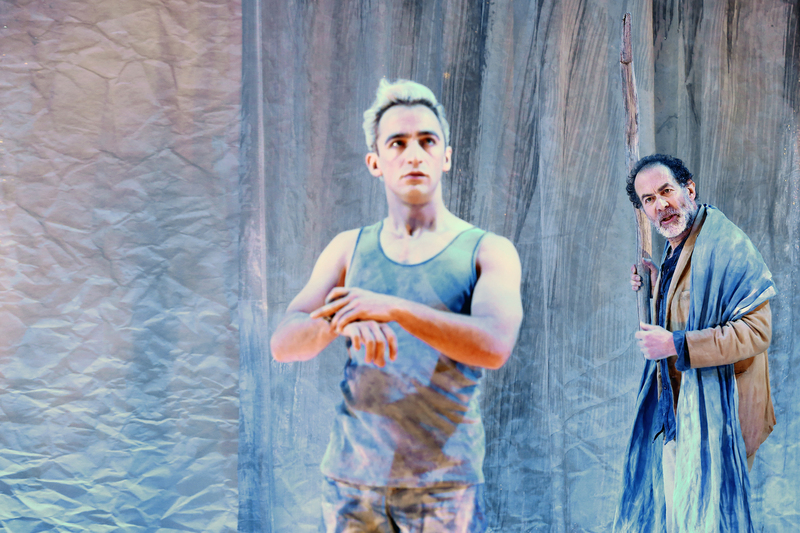 The Tempest plays in Sydney only and ends on September 18. A version of this review appeared in The Australian on August 24.